Ro has a particular fixation with all things “mac”, apple mac to be more precise. Mac and Cheese is no exception. This has to be one of our favourite ways of eating pasta. Perfectly cooked macaroni (read al dente) covered with a creamy sauce and topped with a cheesy bread crumbed layer. It most definitely classifies as comfort food for me. 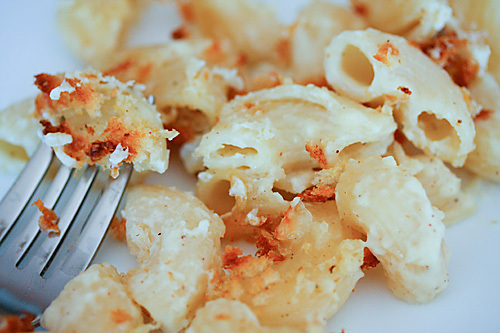 Macaroni and cheese has to be one of the most popular food in the world. There can be endless variations to the basic recipe. What I like most about this recipe is that one can play with it to suit one’s mood or the occasion. 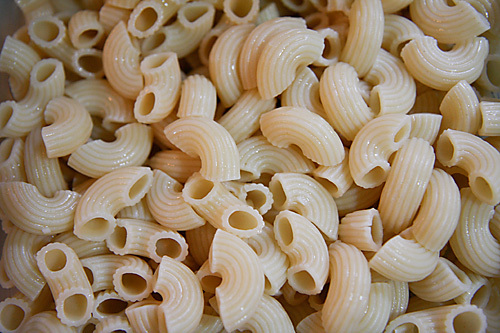 Plain macaroni and cheese is ideal for kids with its bland deliciousness. Chopped herbs like parsely and oregano, spices like paprika or mustard and smoked cheddar instead of plain old cheddar can add variety to the adult palate. Adding cooked vegetables and going easy on the cheese can make for a complete and healthy meal. Certain classics can never go stale and this couldn’t be more true here. We can never tire of eating pasta this way. Served as it is or with my favourite vegetables like broccoli, spinach and corn this recipe is permanently etched in my book. Served with a simple soup and a salad for a “perfect “ lunch or Sunday brunch, I know I cannot go wrong with good old mac and cheese. Add your favourite vegetables and try using different kinds of cheese. Cook the pasta according to manufacturers instructions. In a saucepan or a wok, melt the butter over medium low heat.Stir in the nutmeg powder and the flour and mix until smooth and creamy. Cook the mixture over low heat for a couple of minutes. Take the saucepan away from the fire and pour in the milk with your left hand while continuously stirring the flour butter mixture with the right hand.Return the saucepan to the heat and cook over a medium flame until the sauce comes to a boil. Season with salt and pepper and fold in ¼ cup cheese. Heat 1 tbsp butter in a skillet or a wok and toss in the breadcrumbs and cook until they are coated with the butter, about a minute or so. In a shallow buttered baking dish place the cooked pasta. Fold in the prepared sauce. Spread the remaining grated cheese and sprinkle the buttered breadcrumbs evenly over the cheese. Bake in a pre-heated oven at 200 degree Centigrade (400 degree Fahrenheit or gas mark 6) for about 15 minutes until the top acquires a beautiful golden brown crust. * To make your own breadcrumbs, toast bread in a toaster or skillet, cut the sides and powder in a food processor or blender. I agree with it being great comfort food. I can do mac'n'cheese with some fresh ground pepper anytime! Simi – preheat up the oven and make some for yourself :p… call me while you eat I'll give company! It is a great classic, I make it with mushroom & garlic as that is the way my husband and son enjoy it. Simi and Aru: Enjoy mac'n' cheese and each other's company! Rustoo: Nice to see here after a long time. Yum yum!! I LOVE mac and cheese, it's my idea of comfort food 🙂 This looks deliciously good!!! That is truly appetizing! 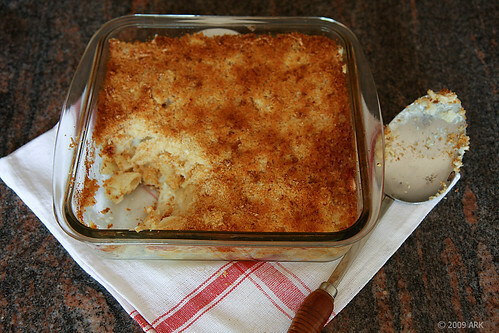 I love baked mac n cheese! Mac and cheese is a favourite around here too. Yours looks wonderful! 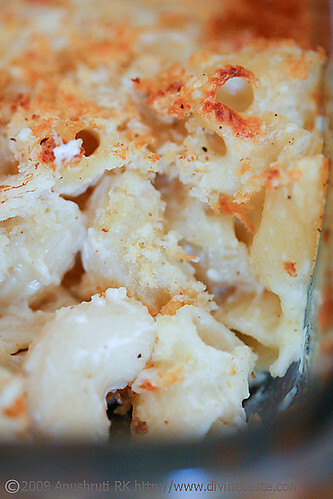 I am drooling again!…lovely mac and cheese! Sannidhi: This is a very comforting dish! Tried this yesterday along with broccoli soup , both tasted heavenly.the only thong missing was the "beautiful golden brown crust" . Thanks for the wonderful recipes , as both pasta n broccoli are my fav. I love eating them as much as i love cooking them n to my pleasant surprise my not so pasta fan husband gave a nod to include bot of them in our regular meal. pakhee: That's nice! Thanks for the feedback! nishita: Sorry for the delay. Yes you can use Amul cheese. can i make this without bread crumbs.